Radha Mitchell and Bruce Willis in "Surrogates." Radha Mitchell at the New York premiere of "The Children of Huang Shi." "Feast of Love" star Radha Mitchell at the Beverly Hills premiere. Radha Mitchell and Billy Burke in "Feast of Love." Radha Mitchell in "Feast of Love." 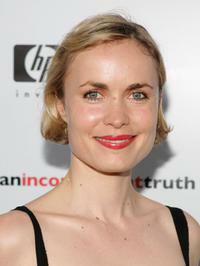 Actress Radha Mitchell at a N.Y. screening of "Feast of Love." Timothy Olyphant and Radha Mitchell in "The Crazies." Radha Mitchell in "The Crazies." Radha Mitchell and Devin Ratray in "Surrogates." Radha Mitchell and Boris Kodjoe in "Surrogates." Radha Mitchell in "Henry Poole is Here." Radha Mitchell as Lee Pearson and Jonathan Rhys Meyers as George Hogg in "The Children of Huang Shi." Radha Mitchell at the Global Green USA's Annual Oscar Party. Radha Mitchell at the 10th Annual Green Cross Millennium Awards. Radha Mitchell at the Global Green Millennium Awards. Radha Mitchell at the California premiere of "Man On Fire." Radha Mitchell at the New York screening of "Melinda and Melinda." Radha Mitchell at the premiere party of "Henry Poole is Here" during the 2008 Sundance Film Festival. Radha Mitchell at the Global Green USA's 5th annual awards season celebration. Radha Mitchell at the 2007/8 Chanel Cruise Show. Radha Mitchell at the Hollywood premiere of "Silent Hill." Radha Mitchell at the Los Angeles premiere of "An Inconvenient Truth." Radha Mitchell at the 62nd Annual Golden Globe Awards. Radha Mitchell at the Penfolds Gala Black Tie dinner. Radha Mitchell at the 13th Annual Elton John Aids Foundation Academy Awards viewing party. Radha Mitchell at the Santa Barbara Film Festival. Radha Mitchell at the cocktail party for the screening of "Man On Fire." Radha Mitchell at the 2004 CFDA Fashion Awards. Radha Mitchell at the California premiere"Finding Neverland." Radha Mitchell at the New York premiere"Finding Neverland." Radha Mitchell at the California premiere of "London Has Fallen." Radha Mitchell at the California premiere of "Olympus Has Fallen."